Wedding Decorations, Wedding Planning, Chair Covers and Sashes and Venue Decorating in Exeter, Newton Abbot, Plymouth, Torquay, Paignton, and Devon. Your wedding day will be the most exciting and romantic day of your life, with the help of decorations any room can be turned into a breath-taking vision. Whether it’s a small intimate ceremony or a large lavish reception, we at Decorations and Celebrations are passionate about making your wedding everything you dreamed of. 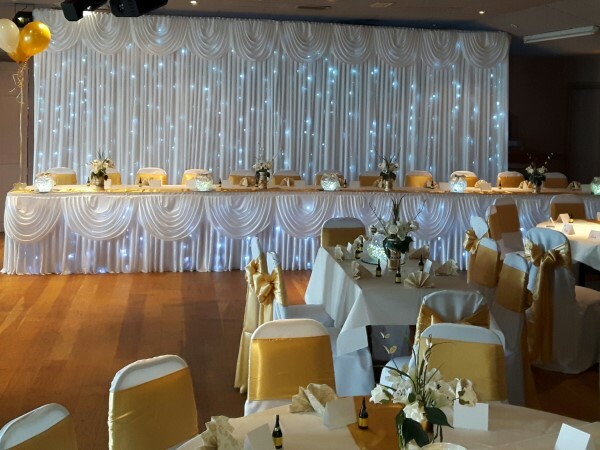 Our team have the knowledge and experience to create different effects with the use of chair covers and sashes, table decorations, starlight backdrops and skirts with full room decorating to transform your venue. 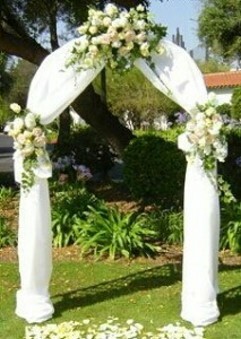 Wow your guests with the room transformed into your dream for your perfect day. 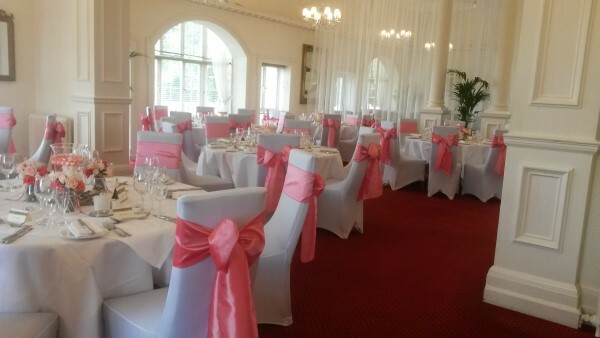 We will decorate the chairs with covers and sashes in the colour and fabric of your choice, choose from organza, satin, taffeta, lace or hessian, finish the look off with a single rose or buckle to add that extra touch. Make your tables look stunning with centrepieces, table runners, petals or crystal scatters, then add a top table and cake table swag and bows for that finishing touch. Coloured mood up lighters, starlight backdrop, wall and ceiling drapes with fairy lights can add sparkle or give a warm and romantic feel. 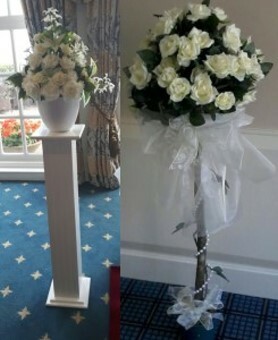 Personalise your wedding by adding floral or fairy light doorways, rose topiary trees, led light trees, columns and archways, post box, wishing well, beautiful balloon displays and lots more to give your venue the full decorating service. If you want to let your imagination run free, we offer a range of themed wedding packages, just talk to us and tell us what you are dreaming of. All our services include full set up and fitting, then we collect everything back the next day so that you don't have to worry about anything, just leave everything to us then all you have to do is focus on getting yourself ready for the most wonderful day of your life. Our initial consultation is free to everyone and leaves you in control of making all the other arrangements but if you want more we also offer through Blue Topaz Events a range of packages from an on the day service where their wedding planner will make sure everything is set up as you want it, to a full wedding planning service where their wedding planner can help you with as much or as little as you want from helping you to find a venue, entertainment or a cake and dress through to managing every detail for you. If you need any ideas for your event Blue Topaz Events can help! !